This chart shows the real GDP growth estimates between 2018 and 2019 by region. 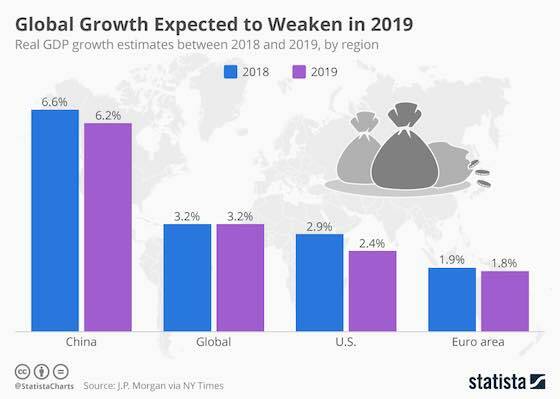 As political and diplomatic turmoil swept the world stage in the last half of 2018, economic prospects for 2019 took a hit, according to new estimates by J.P. Morgan. China experienced a 6.6 percent growth in real GDP in 2018, while in 2019 J.P. Morgan estimates the country will come close to a 6.2 percent growth in real GDP. The United States experienced around a 3 percent growth in real GDP in 2018. Heading into 2019, the U.S. can expect closer to a 2.4 real GDP growth rate. These reduced growth rates come after the trade war between the United State and China hit a crescendo towards the end of the year. At the G20 Summit, there were promises from both sides to ease tensions, though those assurances have yet to translate into substantial action. In the lead up to the holidays, the stock market tumbled losing all its gains since September 2017. The global growth outlook for the world and the Euro area remain relatively flat with little to no growth in real GDP predicted. Economy: "Global Growth Expected to Weaken"